Welcome to the Homasy mini wireless doorbell Review! 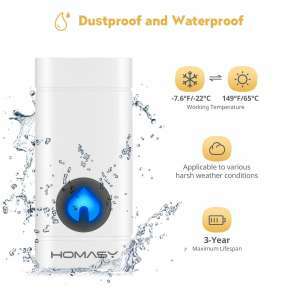 As part of our wireless doorbell reviews, we decided to take a look at the Homasy wireless doorbell to see what this cheap, ultra small wireless doorbell has to offer. You have read that correctly. The receiver unit is square and each side is ONLY 2.3 inches long! It is amazing how a little receiver can pack such a powerful punch in terms of volume. The receivers simply plug into a wall socket and the push button is powered by a 12v23A battery which should see 10,000 presses before it needs to be replaced! 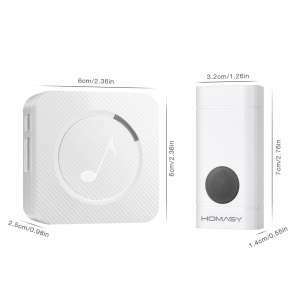 The advertised distance for the Homasy mini wireless doorbell is 600 feet (183m), which means you are likely to get around 50% when installing in your home. 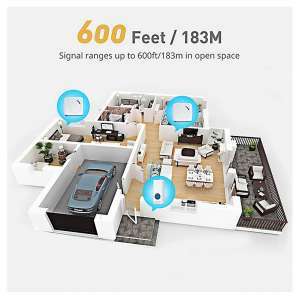 That being said, 600 feet in the open air will give you more than enough distance capabilities for a regular size home. 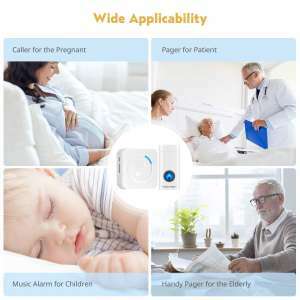 The Homasy has anti-interference wireless technology which acts to greatly reduce the impact from other wireless items you may have around your home. 110dB is more than enough, and the Homasy options must be considered if you are deaf or hard of hearing. 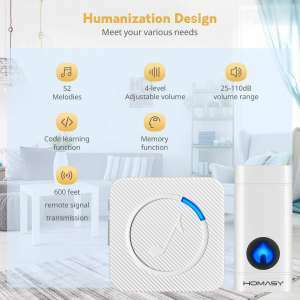 Not only does it have an excellent volume range, but the Homasy also has an LED light to offer a visual alert to alert you to a visitor. 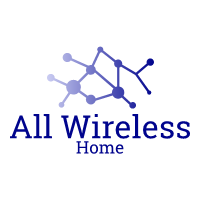 Wireless doorbell installation is easy! The Homasy doorbell is no different. Press the forward or back button to choose your favorite tune, the receiver playing is the tune selected. Hold the volume control button for about 5 seconds and release until a “Ding dong” is heard, and the LED indicator is flashing. 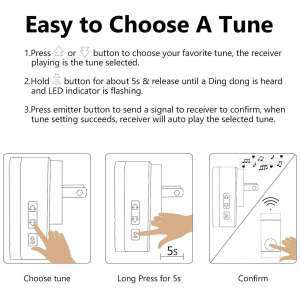 Press the transmitter button to send a signal to receiver a confirm, when the tuning setting is successful, the receiver will play the selected tune automatically. Every Homasy product enjoys a 12-month warranty and a worry free 60 days money back guarantee! After reviewing the Homasy wireless doorbell, we are confident that it will meet your expectations! The design is awesome, for such a small receiver it still makes us wonder how they could make it so loud. The design is very minimalistic and it is such an easy wireless doorbell to install. After the size of the receiver, we could not believe the price per unit! It may be very cheap, but the build quality is good and the reliability cannot be questioned. 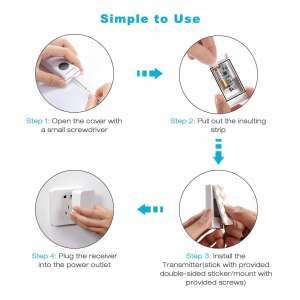 The Homasy wireless doorbell is a small, unobtrusive unit with a belting volume! The price is good, the melodies are awesome, and the speed of installation is quick due to how easy it is. 3 things impressed us during the review; The price, the size, and the volume from such a small receiver! The Homasy is an excellent option for those who are deaf or hard of hearing. It is also fantastic if you do not have much room in your power sockets!